The BAUM L2 Stack Lift increases operator productivity by presenting the stock at a convenient working height. Loading cutting material without the proper equipment increases stress on the back of the cutter operator. The L2 provides an ergonomic solution to reduce back strain while increasing operator efficiency. Net weight, 449 kg I 990 lbs. Electrical: 220/3/60 .75kw I 1 Hp. Space required with pallet, 102 x 105 I 40.19 x 41.31 in. The BAUM L4 Stack Lift increases operator productivity by presenting the stock at a convenient working height. Loading cutting material without the proper equipment increases stress on the back of the cutter operator. The L4 provides an ergonomic solution to reduce back strain while increasing operator efficiency. The BAUM L4 Stack Lift compliments the full line of BaumCut cutters and can be integrated to form a complete inline system with the Baum B2 Jogger. 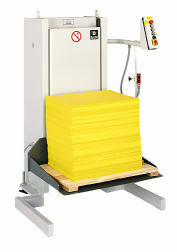 These stack lifts can be utilized wherever significant amounts of material must be loaded or unloaded on pallets.